The phosphatidylinositol 3-kinase (PI3K), AKT, mammalian target of rapamycin (mTOR) signaling pathway (PI3K/AKT/mTOR) is involved in a diverse number of cellular functions and has emerged as one of the most deeply investigated cell signaling networks. This pathway is frequently deregulated in many types of human cancers including acute myeloid leukemia (AML) at multiple points, providing a compelling rationale to consider PI3K/AKT/mTOR as an effective target for therapeutic treatment of AML. This discussion highlights the activation of PI3K/AKT/mTOR and its positive effects on AML. Moreover, we will discuss the development of inhibitors that are used to target PI3K/AKT/mTOR in clinical trials. Targeting the PI3K/AKT/mTOR signaling network with small molecule inhibitors, employed either alone or in combination with other drugs, may result in less toxic and more efficacious treatment of AML patients. Acute myeloid leukemia (AML) is comprised of a group of clonal malignant diseases characterized by deregulated proliferation of immature myeloid cells (Steffen et al., 2005). AML accounts for approximately 80% of all adult leukemias and most patients will relapse and die from the disease (Smith et al., 2004). In AML, there is deregulation of many signaling pathways that include the PI3K/Akt/mTOR, ERK/MAPK, STAT3/5, Wnt/b-catenin and NF-kB pathways (Wu et al., 2004; Sujobert et al., 2005; Tamburini et al., 2007; Steelman et al., 2008; Petropoulos et al., 2008; Guzman et al., 2001). Between 50 and 70% of AML patients have Akt activation by phosphorylation at Thr308 and Ser473 (Brandts et al., 2005). The overall survival of patients who have Akt activation is significantly shorter than that for patients without Akt activation (Min et al., 2003). Moreover, alterations in the PI3K/Akt axis are known to be both associated with and causal of oncogenesis (Martelli et al., 2007; Polak and Buitenhuis, 2012). Therefore, the PI3K/Akt/mTOR signaling pathway appears to represent a valid target for innovative treatments of AML patients. The phosphatidylinositol 3-kinase (PI3Ks) are a large family of kinases that function as intracellular messengers to orchestrate an array of important cellular processes, such as growth, survival and metabolism. Their primary biochemical function is to phosphorylate the 3’-OH group in inositol lipids (Markman et al., 2010). The PI3K family is comprised of three classes (I, II, III), each of which has a distinct structure, distribution in the cell, and mechanism of action. The roles of class II and III PI3Ks are not well-characterized, while class I PI3Ks are widely implicated in the development of cancer. The class I PI3Ks are composed of a regulatory (p85) and a catalytic (p110) subunit (Fruman et al., 1998; Hennessy et al., 2005). There are several isoforms of each subunit. For example, p85 is encoded by the PIK3R1 (p85a), PIK3R2 (p85b) or PIK3R3 (p85g) genes; p110 is encoded by the PIK3CA (p110a), PIK3CB (p110b) or PIK3CC (p110d) genes. Class I PI3Ks are divided into class IA and class IB based on whether they are activated by receptor tyrosine kinases (RTKs) or G-protein coupled receptors (GRCPs) (Markman et al., 2010; Courtney et al., 2010). The class I PI3Ks are responsible for the conversion of the membrane lipid phosphatidylinositol-4,5-biphosphate (PIP2) into phosphatidylinositol-3,4,5-triphosphate (PIP3) through the addition of a phosphate group to the 3’ position of its inositol ring. PIP3 recruits phosphoinositide-dependent protein kinase 1 (PDK1) and AKT to the plasma membrane (Grupp and Harmony, 1985), followed by Akt phosphorylation and activation by PDK1 (Markman et al., 2010; Courtney et al., 2010). The S6K1 and phosphate and tensin homologue deleted on chromosome 10 (PTEN) negatively regulates PI3K/Akt activation by converting PIP3 product to PIP2 (Steelman et al., 2004) (Figure 1). Akt, a serine/threonine protein kinase also known as protein kinase B (PKB), is recruited to the inner surface of plasma membrane through the interaction of its pleckstrin homology (PH) domain with phospholipid products of PI3K. At the plasma membrane, activation of Akt is dependent on phosphorylation, which is achieved at least in part by the protein kinase PDK1 (Brunet et al., 2001; Courtney et al., 2010) (Figure 1). Akt was originally identified as a retroviral oncogene product, v-Akt, that can transform rodent cells (Bellacosa et al., 1991; Staal, 1987). There are three isoforms of Akt which are encoded from distinct genetic loci: Akt1/a; Akt2/b and Akt3/g (Hanada et al., 2004). Overexpression of constitutively activated Akt mutants in many cell types promotes cellular transformation by stimulating proliferation and inhibiting apoptosis (Nicholson and Anderson, 2002). Recently, mounting evidence indicates that Akt overexpression is observed in diverse cancers and Akt perturbations play an important role in human malignancy. Activation of the target of Rapamycin (TOR) has emerged as a major effector of the PI3K/Akt pathway’s ability to govern protein synthesis (Figure 1), a function that is conserved from yeast to mammals (Sabatini et al., 1994; Jacinto and Hall, 2003; Guertin and Sabatini, 2005). The mTORC1 complex is composed of FRAP, Raptor, PRAS40 and LSt8 (Inoki et al., 2002) and its activation is mostly regulated by Akt/tuberous sclerosis 2 (TSC2) axis (Long et al., 2005). Akt inhibits the tuberous sclerosis complex-2 (TSC2) regulated mTORC1 activity through direct phosphorylation of TSC2 at S939 and T1462 (Manning et al., 2002). mTORC1 is also directly phosphorylated and activated as a substrate of Akt (Granville et al., 2006). mTORC1 regulates protein synthesis by activating p70S6K and inactivating 4EBP1 (Holz et al., 2005). The mTORC1 complex is sensitive to rapamycin and inhibits Akt via a negative feedback loop (Hay, 2005). The PI3K/AKT/mTOR signaling cascade is crucial to many widely divergent physiological processes that include cell cycle progression, transcription, translation, differentiation, apoptosis, motility and metabolism. As a result, this pathway has received considerable attention as a potential therapeutic target in malignancy since a gain of function is present in many types of cancers including AML (Campbell et al., 2004; Campbell and Trimble, 2005; Solomon and Pearson, 2009; Altomare and Testa, 2005; Shaw and Cantley, 2006; Uddin et al., 2006). Furthermore, activation of this pathway confers leukemogenic potential to mouse hematopoietic cells (Horn et al., 2008). There are promising preclinical data demonstrating activity of different PI3K/Akt/mTOR targeted agents against AML (Bortul et al., 2005; Papa et al., 2008; Xu et al., 2005; Nguyen et al., 2014). For a number of these malignances, the real promise of these inhibitors is their ability to overcome chemotherapy resistance and synergize with existing cytotoxic therapies. Therefore, this signal transduction cascade may represent a valuable addition to the current regimens for AML. Drugs that target mTOR were the first to be studied, showing remarkable efficacy in a number of conditions. Subsequently, drugs were developed to target PI3K and AKT as well as a number of intermediates in the PI3K/AKT/mTOR signaling pathway, including agents that target individual protein kinases and drugs that target multiple kinases in the pathway (Yap et al., 2008; LoPiccolo et al., 2008). PI3K p110 inhibitors: Wortmannin and LY294002 are classical PI3K inhibitors that induce apoptosis in leukemic progenitors. Wortmannin irreversibly inhibits PI3K by covalent modification of Lys802 while LY294002 competes with ATP for the ATP binding site of PI3K (Sujobert et al., 2005; Luo et al., 2003). However, both Wortmannin and LY294002 are not specific for the PI3K/Akt pathway (Martelli et al., 2006). IC87114 is a potent selective inhibitor of PI3K p110d which down-regulates Akt phosphorylation and cell proliferation in AML blast cells with elevated PI3K p110d but not in normal hematopoietic precursor cells (Sujobert et al., 2005). There are also more potent inhibitors currently under development by pharmaceutical companies such as Piramed, Novartis and Calistoga. For example, CAL-101 (Calistoga) treatment inhibits ribosomal RNA synthesis and cell proliferation in AML cells through inhibition of Akt activation (Nguyen et al., 2014). Results obtained with these inhibitors indicate that selectively targeted PI3K inhibitors are less toxic than those compounds that inhibit all PI3K activities and they may offer greater clinical benefit. mTORC1 inhibitors: mTORC inhibitors are the most developed class of compounds that target the PI3K/Akt pathway including rapamycin, CCI-779, RAD001 and AP23573. Rapamycin has shown activity against many types of cancer in phase I and II clinical trials (Granville et al., 2006). Moreover, combination treatment of rapamycin with other inhibitors may be synergistic. For examples, combined treatment with rapamycin and etoposide dramatically increases cytotoxicity in AML blast (Xu et al., 2005); adding UCN-01 to rapamycin results in marked apoptosis in U937 cells (Hahn et al., 2005); and treatment with rapamycin and the cell permeable glycolytic inhibitor 3-bromo-2-oxoproprionate-1-propyl ester has synergistic effects on HL60 leukemia cell cytotoxicity (Xu et al., 2005). Although some patients do not respond to rapamycin treatment (Recher et al., 2005) and mechanisms of resistance to rapamycin have been identified (Giles and Albitar, 2005), it is still considered to be of particular interest due to its ability to inhibit the growth of cancer cells and induce apoptosis. Another mTOR inhibitor, CCI-779, has been used in clinical trial with metastatic renal carcinoma patients. Both RAD001 and AP23573, two additional mTOR inhibitors, are also in clinical trials as antitumor drugs (Cheng et al., 2005). Akt inhibitors: a new class of Akt inhibitors are in the phosphatidylinositol ether analog (PIAs) family and include perifosine, deguelin and AEZS-127. PIAs are inhibitors that bind to the PH domain of Akt and prevent its translocation to the plasma membrane, thereby inhibiting the phosphorylation and activation of Akt. These inhibitors sensitize leukemic cells to the effects of other chemotherapies (Gills and Dennis, 2004). Perifosine dephosphorylates Akt and ERK 1/2 and activates caspases, inducing apoptosis in leukemic cells (Papa et al., 2008). Deguelin inhibits Akt through an unknown mechanism and increase AML sensitivity to cytarabine (Bortul et al., 2005). AEZS-127 is an alkylphospholipid and has been tested in phase I for relapsed hematologic malignancies (Park et al., 2009). The compound AZD8055, an inhibitor of both Akt and mTOR, shows more efficacy than rapamycin in decreasing ribosomal RNA synthesis and inhibiting the growth of leukemic cells in vitro and in vivo (Nguyen and Mitchell, 2013; Nguyen et al., 2014). Akt inhibitors have the potential to provide greater efficacy and less toxicity to patients. The PI3K/AKT/mTOR signaling pathway is aberrantly activated in a number of malignant and non-malignant diseases. It represents one of the major survival pathways that contribute to both cancer pathogenesis and drug resistance. As a result, preclinical studies and clinical trials have been designed to investigate compounds that target the various components of the pathway. Here, we described the efficacy and toxicity of agents that target the PI3K/AKT/mTOR signaling pathway in AML. The development of compounds directed against PI3K/Akt and mTORC and their modulators as novel and potent agents for treating AML is expanding and additional work is needed to determine the potential of PI3K/Akt/mTOR inhibitors in the treatment of AML. Fig. 1: Targeting the PI3K/AKT/mTOR signaling in Acute Myeloid Leukemia. RTKs: Receptor Tyrosine Kinases; PTEN: Phosphate and Tensin homologue deleted on chromosome 10; PIP2: Phosphatidylinositol-4,5-biphosphate; PIP3: Phosphatetidylinositol-3,4,5-triphosphate; PDK1: Phosphoinositide-dependent protein kinase 1; Akt: Protein kinase PKB/Akt. The authors thank Dr. Beverly S. Mitchell for reading and comments on the manuscript. This work was supported by a research of science and technology grant from Department of Science and Technology of Ho Chi Minh City, Vietnam to LXTN and DQN (226/2013/HD-SKHCN). Thạc sĩ - Bác sĩ Nguyễn Hữu Phúc hiện là bác sĩ giải phẫu chuyên ngành ung thư công tác tại bệnh viện ung bướu TPHCM. Ngoài ra, anh còn là giảng viên bộ môn ung thư trường ĐH Y Dược TPHCM. Tiến sĩ Đỗ Thị Thu Hằng tốt nghiệp tiến sĩ ngành Dược tại ĐH Sungkyunkwan, Hàn Quốc. Chị hiện đang công tác tại Đại học Quốc gia TPHCM. Tiến sĩ - Bác sĩ Lý Quốc Trung tốt nghiệp tiến sĩ chuyên ngành y học ung thư tại ĐH Kanazawa, Nhật Bản. Anh hiện đang công tác tại bệnh viện đa khoa tỉnh Sóc Trăng. Tiến sĩ Phạm Nguyễn Đức Hoàng tốt nghiệp tiến sĩ tại ĐH Chiba, Nhật Bản và hiện là trưởng phòng vi sinh tại Trung tâm Công nghệ Sinh học (TT CNSH) TPHCM. Tiến sĩ Nguyễn Đăng Quân tốt nghiệp tiến sĩ chuyên ngành miễn dịch học tại đại học Justus Liebig, Đức. Anh hiện là trưởng phòng Công nghệ Y sinh tại TT CNSH TPHCM. Tiến sĩ Nguyễn Lê Xuân Trường tốt nghiệp cử nhân ngành CNSH năm 2004 tại Đại học Khoa học Tự nhiên (ĐH KHTN) TPHCM. Sau đó, anh nhận được học bổng đào tạo tiến sĩ chuyên ngành sinh học phân tử tế bào tại ĐH Sungkyunkwan, Hàn quốc từ năm 2004-2010. Sau khi tốt nghiệp, anh về Việt Nam giảng dạy tại ĐH KHTN từ năm 2010 đến năm 2011 trước khi sang Mỹ làm nghiên cứu sau tiến sĩ tại viện ung thư thuộc đại học Stanford. Hiện nay anh là chuyên gia khoa học công tác tại TT CNSH TPHCM. 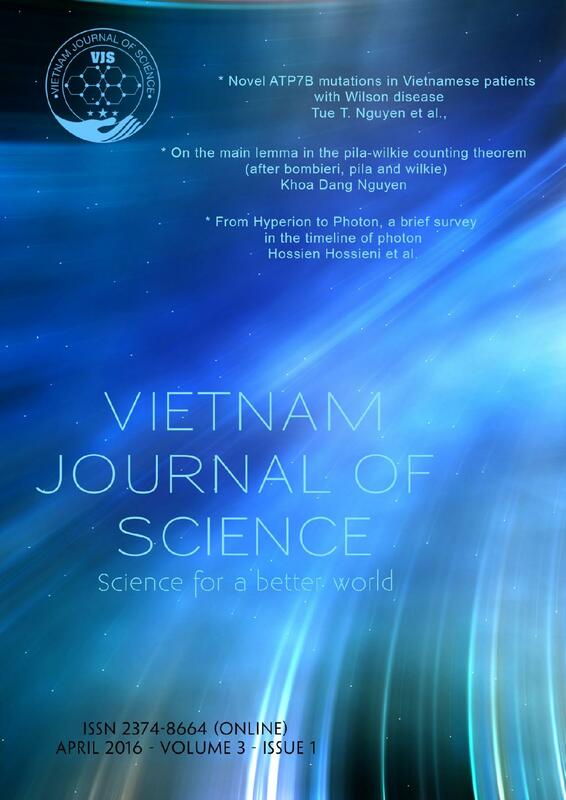 Anh cũng là biên tập của tạp chí Việt Nam Journal of Sciences phụ trách lĩnh vực y-sinh học. Altomare, D.A., and J.R. Testa. 2005. Perturbations of the AKT signaling pathway in human cancer. Oncogene. 24:7455-7464. Bellacosa, A., J.R. Testa, S.P. Staal, and P.N. Tsichlis. 1991. A retroviral oncogene, akt, encoding a serine-threonine kinase containing an SH2-like region. Science. 254:274-277. Bortul, R., P.L. Tazzari, A.M. Billi, G. Tabellini, I. Mantovani, A. Cappellini, T. Grafone, G. Martinelli, R. Conte, and A.M. Martelli. 2005. Deguelin, A PI3K/AKT inhibitor, enhances chemosensitivity of leukaemia cells with an active PI3K/AKT pathway. British journal of haematology. 129:677-686. Brandts, C.H., B. Sargin, M. Rode, C. Biermann, B. Lindtner, J. Schwable, H. Buerger, C. Muller-Tidow, C. Choudhary, M. McMahon, W.E. Berdel, and H. Serve. 2005. Constitutive activation of Akt by Flt3 internal tandem duplications is necessary for increased survival, proliferation, and myeloid transformation. Cancer research. 65:9643-9650. Brunet, A., S.R. Datta, and M.E. Greenberg. 2001. Transcription-dependent and -independent control of neuronal survival by the PI3K-Akt signaling pathway. Current opinion in neurobiology. 11:297-305. Campbell, M., W.E. Allen, C. Sawyer, B. Vanhaesebroeck, and E.R. Trimble. 2004. Glucose-potentiated chemotaxis in human vascular smooth muscle is dependent on cross-talk between the PI3K and MAPK signaling pathways. Circulation research. 95:380-388. Campbell, M., and E.R. Trimble. 2005. Modification of PI3K- and MAPK-dependent chemotaxis in aortic vascular smooth muscle cells by protein kinase CbetaII. Circulation research. 96:197-206. Cheng, J.Q., C.W. Lindsley, G.Z. Cheng, H. Yang, and S.V. Nicosia. 2005. The Akt/PKB pathway: molecular target for cancer drug discovery. Oncogene. 24:7482-7492. Courtney, K.D., R.B. Corcoran, and J.A. Engelman. 2010. The PI3K pathway as drug target in human cancer. Journal of clinical oncology : official journal of the American Society of Clinical Oncology. 28:1075-1083. Fruman, D.A., R.E. Meyers, and L.C. Cantley. 1998. Phosphoinositide kinases. Annual review of biochemistry. 67:481-507. Giles, F.J., and M. Albitar. 2005. Mammalian target of rapamycin as a therapeutic target in leukemia. Current molecular medicine. 5:653-661. Gills, J.J., and P.A. Dennis. 2004. The development of phosphatidylinositol ether lipid analogues as inhibitors of the serine/threonine kinase, Akt. Expert opinion on investigational drugs. 13:787-797. Granville, C.A., R.M. Memmott, J.J. Gills, and P.A. Dennis. 2006. Handicapping the race to develop inhibitors of the phosphoinositide 3-kinase/Akt/mammalian target of rapamycin pathway. Clinical cancer research : an official journal of the American Association for Cancer Research. 12:679-689. Grupp, S.A., and J.A. Harmony. 1985. Increased phosphatidylinositol metabolism is an important but not an obligatory early event in B lymphocyte activation. Journal of immunology. 134:4087-4094. Guertin, D.A., and D.M. Sabatini. 2005. An expanding role for mTOR in cancer. Trends in molecular medicine. 11:353-361. Guzman, M.L., S.J. Neering, D. Upchurch, B. Grimes, D.S. Howard, D.A. Rizzieri, S.M. Luger, and C.T. Jordan. 2001. Nuclear factor-kappaB is constitutively activated in primitive human acute myelogenous leukemia cells. Blood. 98:2301-2307. Hahn, M., W. Li, C. Yu, M. Rahmani, P. Dent, and S. Grant. 2005. Rapamycin and UCN-01 synergistically induce apoptosis in human leukemia cells through a process that is regulated by the Raf-1/MEK/ERK, Akt, and JNK signal transduction pathways. Molecular cancer therapeutics. 4:457-470. Hanada, M., J. Feng, and B.A. Hemmings. 2004. Structure, regulation and function of PKB/AKT--a major therapeutic target. Biochimica et biophysica acta. 1697:3-16. Hennessy, B.T., D.L. Smith, P.T. Ram, Y. Lu, and G.B. Mills. 2005. Exploiting the PI3K/AKT pathway for cancer drug discovery. Nature reviews. Drug discovery. 4:988-1004. Holz, M.K., B.A. Ballif, S.P. Gygi, and J. Blenis. 2005. mTOR and S6K1 mediate assembly of the translation preinitiation complex through dynamic protein interchange and ordered phosphorylation events. Cell. 123:569-580. Horn, S., U. Bergholz, M. Jucker, J.A. McCubrey, L. Trumper, C. Stocking, and J. Basecke. 2008. Mutations in the catalytic subunit of class IA PI3K confer leukemogenic potential to hematopoietic cells. Oncogene. 27:4096-4106. Inoki, K., Y. Li, T. Zhu, J. Wu, and K.L. Guan. 2002. TSC2 is phosphorylated and inhibited by Akt and suppresses mTOR signalling. Nature cell biology. 4:648-657. Jacinto, E., and M.N. Hall. 2003. Tor signalling in bugs, brain and brawn. Nature reviews. Molecular cell biology. 4:117-126. Long, X., Y. Lin, S. Ortiz-Vega, K. Yonezawa, and J. Avruch. 2005. Rheb binds and regulates the mTOR kinase. Current biology : CB. 15:702-713. LoPiccolo, J., G.M. Blumenthal, W.B. Bernstein, and P.A. Dennis. 2008. Targeting the PI3K/Akt/mTOR pathway: effective combinations and clinical considerations. Drug resistance updates : reviews and commentaries in antimicrobial and anticancer chemotherapy. 11:32-50. Luo, J., B.D. Manning, and L.C. Cantley. 2003. Targeting the PI3K-Akt pathway in human cancer: rationale and promise. Cancer cell. 4:257-262. Manning, B.D., A.R. Tee, M.N. Logsdon, J. Blenis, and L.C. Cantley. 2002. Identification of the tuberous sclerosis complex-2 tumor suppressor gene product tuberin as a target of the phosphoinositide 3-kinase/akt pathway. Molecular cell. 10:151-162. Markman, B., R. Dienstmann, and J. Tabernero. 2010. Targeting the PI3K/Akt/mTOR pathway--beyond rapalogs. Oncotarget. 1:530-543. Martelli, A.M., M. Nyakern, G. Tabellini, R. Bortul, P.L. Tazzari, C. Evangelisti, and L. Cocco. 2006. Phosphoinositide 3-kinase/Akt signaling pathway and its therapeutical implications for human acute myeloid leukemia. Leukemia. 20:911-928. Martelli, A.M., P.L. Tazzari, C. Evangelisti, F. Chiarini, W.L. Blalock, A.M. Billi, L. Manzoli, J.A. McCubrey, and L. Cocco. 2007. Targeting the phosphatidylinositol 3-kinase/Akt/mammalian target of rapamycin module for acute myelogenous leukemia therapy: from bench to bedside. Current medicinal chemistry. 14:2009-2023. Min, Y.H., J.I. Eom, J.W. Cheong, H.O. Maeng, J.Y. Kim, H.K. Jeung, S.T. Lee, M.H. Lee, J.S. Hahn, and Y.W. Ko. 2003. Constitutive phosphorylation of Akt/PKB protein in acute myeloid leukemia: its significance as a prognostic variable. Leukemia. 17:995-997. Nguyen le, X.T., S.M. Chan, T.D. Ngo, A. Raval, K.K. Kim, R. Majeti, and B.S. Mitchell. 2014. Interaction of TIF-90 and filamin A in the regulation of rRNA synthesis in leukemic cells. Blood. 124:579-589. Nguyen le, X.T., and B.S. Mitchell. 2013. Akt activation enhances ribosomal RNA synthesis through casein kinase II and TIF-IA. Proceedings of the National Academy of Sciences of the United States of America. 110:20681-20686. Nguyen, L.X., A. Sesay, and B.S. Mitchell. 2014. Effect of CAL-101, a PI3Kdelta inhibitor, on ribosomal rna synthesis and cell proliferation in acute myeloid leukemia cells. Blood cancer journal. 4:e228. Nicholson, K.M., and N.G. Anderson. 2002. The protein kinase B/Akt signalling pathway in human malignancy. Cellular signalling. 14:381-395. Papa, V., P.L. Tazzari, F. Chiarini, A. Cappellini, F. Ricci, A.M. Billi, C. Evangelisti, E. Ottaviani, G. Martinelli, N. Testoni, J.A. McCubrey, and A.M. Martelli. 2008. Proapoptotic activity and chemosensitizing effect of the novel Akt inhibitor perifosine in acute myelogenous leukemia cells. Leukemia. 22:147-160. Park, S., N. Chapuis, J. Tamburini, V. Bardet, P. Cornillet-Lefebvre, L. Willems, A. Green, P. Mayeux, C. Lacombe, and D. Bouscary. 2010. Role of the PI3K/AKT and mTOR signaling pathways in acute myeloid leukemia. Haematologica. 95:819-828. Petropoulos, K., N. Arseni, C. Schessl, C.R. Stadler, V.P. Rawat, A.J. Deshpande, B. Heilmeier, W. Hiddemann, L. Quintanilla-Martinez, S.K. Bohlander, M. Feuring-Buske, and C. Buske. 2008. A novel role for Lef-1, a central transcription mediator of Wnt signaling, in leukemogenesis. The Journal of experimental medicine. 205:515-522. Polak, R., and M. Buitenhuis. 2012. The PI3K/PKB signaling module as key regulator of hematopoiesis: implications for therapeutic strategies in leukemia. Blood. 119:911-923. Recher, C., O. Beyne-Rauzy, C. Demur, G. Chicanne, C. Dos Santos, V.M. Mas, D. Benzaquen, G. Laurent, F. Huguet, and B. Payrastre. 2005. Antileukemic activity of rapamycin in acute myeloid leukemia. Blood. 105:2527-2534. Sabatini, D.M., H. Erdjument-Bromage, M. Lui, P. Tempst, and S.H. Snyder. 1994. RAFT1: a mammalian protein that binds to FKBP12 in a rapamycin-dependent fashion and is homologous to yeast TORs. Cell. 78:35-43. Shaw, R.J., and L.C. Cantley. 2006. Ras, PI(3)K and mTOR signalling controls tumour cell growth. Nature. 441:424-430. Smith, M., M. Barnett, R. Bassan, G. Gatta, C. Tondini, and W. Kern. 2004. Adult acute myeloid leukaemia. Critical reviews in oncology/hematology. 50:197-222. Solomon, B., and R.B. Pearson. 2009. Class IA phosphatidylinositol 3-kinase signaling in non-small cell lung cancer. Journal of thoracic oncology : official publication of the International Association for the Study of Lung Cancer. 4:787-791. Staal, S.P. 1987. Molecular cloning of the akt oncogene and its human homologues AKT1 and AKT2: amplification of AKT1 in a primary human gastric adenocarcinoma. Proceedings of the National Academy of Sciences of the United States of America. 84:5034-5037. Steelman, L.S., S.L. Abrams, J. Whelan, F.E. Bertrand, D.E. Ludwig, J. Basecke, M. Libra, F. Stivala, M. Milella, A. Tafuri, P. Lunghi, A. Bonati, A.M. Martelli, and J.A. McCubrey. 2008. Contributions of the Raf/MEK/ERK, PI3K/PTEN/Akt/mTOR and Jak/STAT pathways to leukemia. Leukemia. 22:686-707. Steelman, L.S., S.C. Pohnert, J.G. Shelton, R.A. Franklin, F.E. Bertrand, and J.A. McCubrey. 2004. JAK/STAT, Raf/MEK/ERK, PI3K/Akt and BCR-ABL in cell cycle progression and leukemogenesis. Leukemia. 18:189-218. Steffen, B., C. Muller-Tidow, J. Schwable, W.E. Berdel, and H. Serve. 2005. The molecular pathogenesis of acute myeloid leukemia. Critical reviews in oncology/hematology. 56:195-221. Sujobert, P., V. Bardet, P. Cornillet-Lefebvre, J.S. Hayflick, N. Prie, F. Verdier, B. Vanhaesebroeck, O. Muller, F. Pesce, N. Ifrah, M. Hunault-Berger, C. Berthou, B. Villemagne, E. Jourdan, B. Audhuy, E. Solary, B. Witz, J.L. Harousseau, C. Himberlin, T. Lamy, B. Lioure, J.Y. Cahn, F. Dreyfus, P. Mayeux, C. Lacombe, and D. Bouscary. 2005. Essential role for the p110delta isoform in phosphoinositide 3-kinase activation and cell proliferation in acute myeloid leukemia. Blood. 106:1063-1066. Tamburini, J., C. Elie, V. Bardet, N. Chapuis, S. Park, P. Broet, P. Cornillet-Lefebvre, B. Lioure, V. Ugo, O. Blanchet, N. Ifrah, F. Witz, F. Dreyfus, P. Mayeux, C. Lacombe, and D. Bouscary. 2007. Constitutive phosphoinositide 3-kinase/Akt activation represents a favorable prognostic factor in de novo acute myelogenous leukemia patients. Blood. 110:1025-1028. Uddin, S., A.R. Hussain, A.K. Siraj, P.S. Manogaran, N.A. Al-Jomah, A. Moorji, V. Atizado, F. Al-Dayel, A. Belgaumi, H. El-Solh, A. Ezzat, P. Bavi, and K.S. Al-Kuraya. 2006. Role of phosphatidylinositol 3'-kinase/AKT pathway in diffuse large B-cell lymphoma survival. Blood. 108:4178-4186. Wu, J., W.W. Wong, F. Khosravi, M.D. Minden, and L.Z. Penn. 2004. Blocking the Raf/MEK/ERK pathway sensitizes acute myelogenous leukemia cells to lovastatin-induced apoptosis. Cancer research. 64:6461-6468. Xu, Q., J.E. Thompson, and M. Carroll. 2005. mTOR regulates cell survival after etoposide treatment in primary AML cells. Blood. 106:4261-4268. Xu, R.H., H. Pelicano, H. Zhang, F.J. Giles, M.J. Keating, and P. Huang. 2005. Synergistic effect of targeting mTOR by rapamycin and depleting ATP by inhibition of glycolysis in lymphoma and leukemia cells. Leukemia. 19:2153-2158. Yap, T.A., M.D. Garrett, M.I. Walton, F. Raynaud, J.S. de Bono, and P. Workman. 2008. Targeting the PI3K-AKT-mTOR pathway: progress, pitfalls, and promises. Current opinion in pharmacology. 8:393-412.